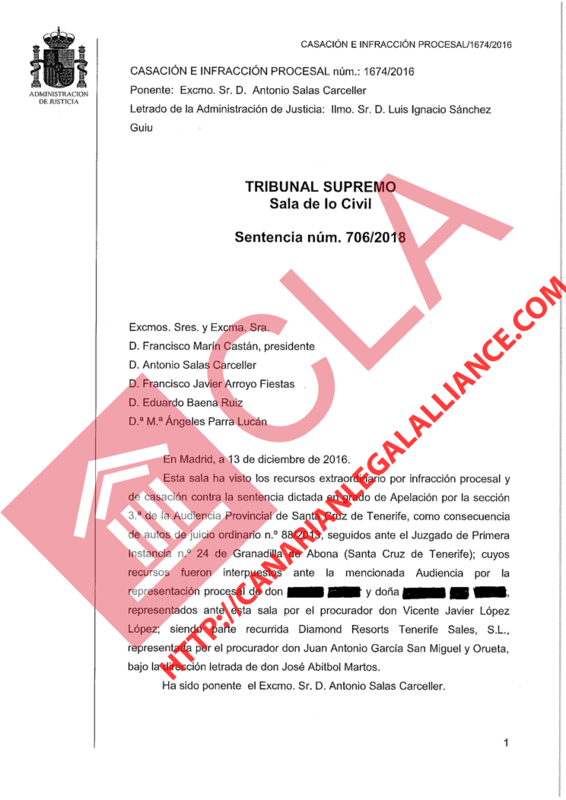 Canarian Legal Alliance is proud and excited to share its recent Supreme Court victory against Diamond Resorts. The highest-ranking court in Spain has continued defending consumers ruling our British clients Diamond Resorts contract null and void. Just as in other sentences, the Supreme Court highlighted the fact that the contract had no end date and was therefore sold to the clients in perpetuity, illegal under the Spanish Timeshare Law of 42/98. The Supreme Court has also awarded our clients all those monies paid within the first three months of the contract’s lifespan in double, reaffirming its stance on illegal deposit taking by timeshare resorts. Diamond Resorts will now have to refund over £11,625 plus legal fees and legal interest. IF YOU OWN DIAMOND AND WANT OUT OF YOUR CONTRACT CONTACT US NOW FOR A FREE CONSULTATION AND REVIEW YOUR LEGAL OPTIONS.